Dr. Norma Kirby served as guest speaker. Pictured are the 3rd, 4th, and 5th grade students from Washington Elementary in the C.A.T.S. choir directed by Christian Scott and Marilyn Wills. 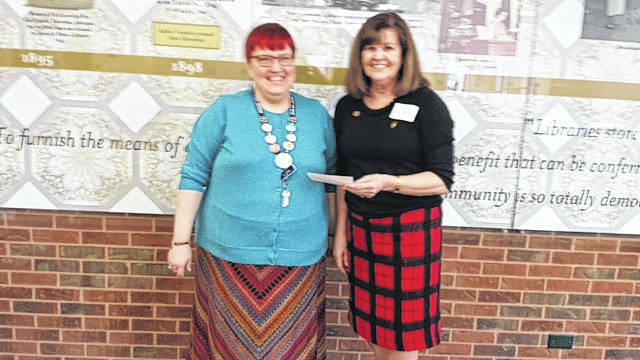 DKG treasurer Helenlu Morgan on the left presenting a check to Lynn Pauley on the right for the Bossard Library. 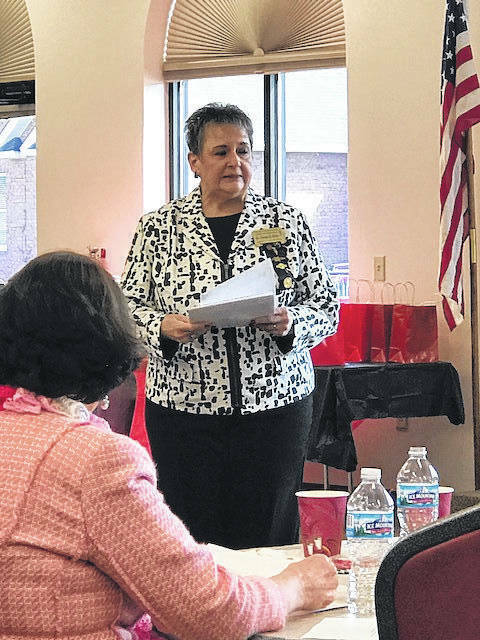 GALLIPOLIS — Three local chapters (Beta Alpha, Alpha Omicron, and Delta Epsilon) of Delta Kappa Gamma held their regional meeting on March 10 in the River Room at the Bossard Memorial Library. Thirty-six members were welcomed to the meeting by Lynn Arnott, Beta Alpha President. The group enjoyed a brunch prepared by the Colony Club. As part of the program, the C.A.T.S. 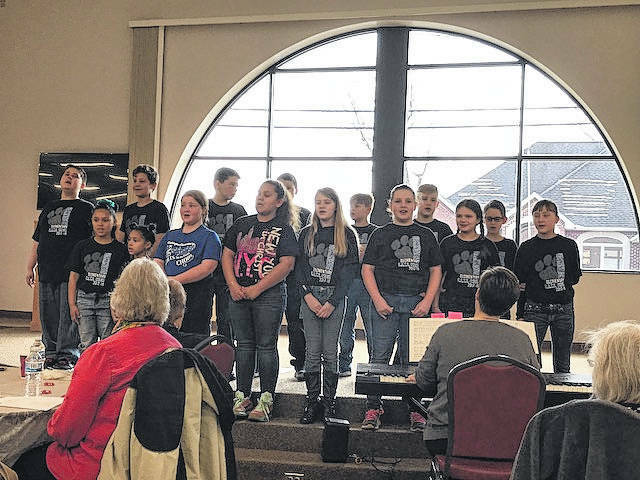 choir from Washington Elementary performed several musical selections. The choir is comprised of third, fourth, and fifth grade students there to learn more about music and performing. They are under the direction Christian Scott and Marilyn Wills. The guest speaker for the meeting was Dr. Norma Kirby. Kirby is a retired teacher from the Miami Trace district and a former state president of Delta Kappa Gamma. The main focus of her presentation was presenting detailed information about the Alpha Delta State Ohio Educational Foundation. The foundation’s mission is to effectively raise money and manage resources to promote excellence in education by rewarding scholarships, grants, and fellowships for professional and personal growth of members and non-members. The goals are to provide programs and seminars that reach more members, assist practicing educators in providing the best education possible, focus on state of the art topics and projects for educators and learners, become known for our impact and service to communities. Its first annual meeting will be held in conjunction with the DKG state meeting to be held in April. The Beta Alpha Chapter donated $100 to the library. The meeting was adjourned with the DKG song, awarding of door prizes, and presenting members attending with a gift bag containing items from Bob Evans, Ohio Valley Bank, Farmers Bank, Gallipolis Visitor’s Center, Schrock’s, Bossard Library, and Holzer. Door prize winners were: Darlene Ringhand, Anita Fisher, Cheryl Wiesenberger, Barb Rhodes, Jane Ann Slagle, Rebecca Searcher, Mary Withee, Gail Belville, Helenlu Morgan, Emma Ashley, and Karen Cornell. The next meeting of the local chapter of DKG will be at Rio Grande Elementary at 6:30 on Friday, April 13. Submitted on behalf of the local chapter of DKG.